Follow up lesson for the video "一番好きな日本語は何？"
= Ichiban sukina nihongo wa? Please watch the video, 「一番好きな日本語は何？　( = ichiban sukina nihongo wa nani? ) 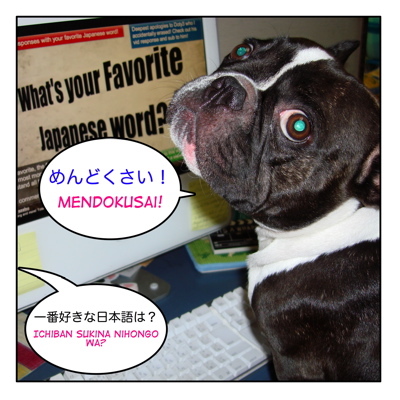 What is your favorite Japanese word?」first and check the following list that I made. = Boku ano tori no kuchibashi daisuki! = I love that bird’s beak! = Anata ha hontou ni wagamama desu! = You are really selfish! ♦分かりました = わかりました = wakarimashita = I understand. / I got it. = Warau kado niwa fuku kitaru. ♦お疲れ様です。 = おつかれさまです。= Otsukare sama desu. = Thank you for all your (hard) work. ♦すみません = sumimasen = Excuse me! or I am sorry! = Do you need a bag. = It is important to get along. = Are you all right?/OK? = Chotto ukagai tai koto ga arun desu ga.
= Excuse me but may I ask you a question? ♦誰ですか？ = だれですか？ = Dare desuka? = Who are you? = Watashi wa “kaban” desu. ♦抱きしめて = だきしめて = Dakisihmete = Hold me tight! Ex. 芸を仕込む = げいをしこむ = gei wo shikomu = to train (an animal) some trick. ♦むっちゃ = muccha = (colloquial) Very! Super! ♦まさか = masaka = It can’t be true! / No way! ♦失礼します。= しつれいします = shiturei shimasu. = “May I come in?” “Good-bye” “Excuse me..”,etc. = Kono ringo wa sorehodo takaku naidesu. = This apple is not that expensive. ♦弱肉強食 = じゃくにくきょうしゅく = jakuniku kyoushoku = dog-eat-dog world. Survival of the strongest. ♦乾杯 = かんぱい = kanpai = Cheers! ♦飽きる = あきる = akiru = to get tired of something. ♦妖怪 = ようかい = youkai = specter, spook, ghost, goblin, etc. ♦散歩に行く？ = さんぽにいく？= Sanpo ni iku? = Wanna go for a walk? ♦感謝しています。 = かんしゃしています = Kansha shiteimasu. = I appreciate it. 長いリストでしょ！ = Nagai risuto desho! = Isn’t it a long list? でも、皆さんも、お疲れ様でした！ = Demo minasan mo otsukare sama deshita! = But good job everyone! Oh! I also like 水 and 音 because those were the first Japanese words I learned for a haiku in middle school. Its sound nice for me. 私の一番好きな日本語の言葉は救急車。　It reminds me of world of warcraft, where when a person whines about something bad that happened, someone else will say QQ, or QQ more, or less QQ more pewpew. Because QQ is supposed to look like two eyes crying. When someone says QQ it kind of means, get over it. 救急 sounds like QQ, huh? なるほど！I see..Tashika ni QQ looks like someone is crying.. I like this list a lot! Is 激～ used in the same way as 超～? Like,　超安い or 超辛い? 激 and 超 are both use to add the meaning of “super”. Usually “激” comes before a noun form and “超” comes before adjetive form. People do *激安 (geki yasu) あのカメラは激安だった。(Ano kamera wa gekiyasu datta) That camera was very cheap. *超安い (chou yasui) あのカメラは超安かった。(Ano kamera wa chou yasukatta.) The same meaning. *激辛(gekikara) このカレーは激辛だ。（Kono karei wa gekikara da.) This curry is super hot. *超辛い(chou karai) このカレーは超辛い。(Kono karei wa chou karai.) The same meaning. ＊激混み(Gekikomi) 今朝の電車は激混みだった。(Kesa no densha wa gekikomi datta.) The train was super crowded this morning. ＊超混んでいる(Chou konde iru.) 今朝の電車は超混んでいた。(Kesa no densha wa chou konde ita.) The same meaning. If we google “超美味しい” (chouoishii) & “激美味しい” (gekioishii), means “super delicious”,”超美味しい” will get more hits. Some adjetives and nouns never take 激 or 超, though. So please search the word you want to use with 激 or 超 on Google and check if they use it or not. 超激レア (Chou geki rea!) means it is super rare! 超激安　（Chou geki yasu) Super cheap! They are kind of fun words, huh? That’s just silly and confusing. Atleast I get it now. Sweet, I see that all the favorite Japanese words are here! I have a question though, “zenbu” or “zennbu” (the second n to make the ん character) is written as “zembu” in a Japanese dictionary. How come? There is no “m” character. And it’s still written as ぜんぶ . I’ve seen this with other words as well, like “kampai” Do you have any idea why? 1) form is “Romaji” which Japanese people use. 2) form is for non-native people to pronounce Japanese words. 2) form could be easier to read Japanese words with. Ex. Combat is “Konbatto” in Romaji. But orthographically they use “m”instead of “n” before “b” or “p” when they spell in English. So I think you can write in both ways. また来てね！　Mata kitene! Please visit me again!